The road since the end of the USWNT’s victory in Canada over the summer has been anything BUT difficult. Romping victories have certainly had all the makings of a victory tour, but the She Believes Cup is certainly a different animal. Any chance that your squad can get to go up against three of the other top five teams in the world, your true colors are certainly going to show. Now, after two of the three legs that will be played, the USWNT has a great shot at the World Cup and Olympic double that has eluded squads for years. After a 1-0 victory in the first game, a trip to a surprisingly vocal and stadium-filling Tennessee crowd sees the USWNT going up against a team that many consider to be the most fluid and creative team in the world’s game today: France. After knocking off some of the rust that seems to come with pounding on much lower opposition the team struggled early against France’s pressure and showed little going forward. The wing dominated by Klingenberg and Heath still seems to show a world of promise in terms of attack (something Portland Thorns fans will be drooling over), but the number of times that the USWNT was exposed on the wings shows that there is still a lot of work to be done on the team’s defensive shape. There still doesn’t seem to be a definitive answer for someone to sit defensively for this squad. In fact, we are starting to see Johnston become one of the most adventurous central defenders at the top level of the world’s game (perhaps it is her recent shift to the number “8”)…putting increased pressure on the USWNT finding an answer for shoring up their central issues. Lindsey Horan might be the answer in the future, but she certainly is not the answer now. Luckily, a half dominated by the French, would end 0-0 under the sun in Nashville. In the second half, the USWNT would finally start to find their footing. While the newly integrated Pugh seems to have been given license to dribble at will, her decision making still shows the youth…(but, it also showed, she is a future superstar with this team). Luckily, after a half of “almost,” Pugh played a perfectly weighted through ball to Alex Morgan for her to slot home a stoppage time winner. With Germany winning the second game, this sets the stage perfectly for the final in the SheBelievesCup. However, it will continue to show that there are a plethora of cracks that the USWNT still needs to paper over. One of the issues that is continuing to sit in the back of minds is Hope Solo’s role with this team. Her issues with travelling to Rio have now become quite vocal, and the team continues to look overly reliant on the keeper. Without a few of her trademark saves, this game could have ended very differently for the USWNT. However, the lack of development for a replacement continues to glare the squad’s future in the face. Every other section of the field continues to see viable replacements popping up from within the youth ranks, but Solo’s spot feels like a huge vacancy will be felt. It also might have been a bit of a pessimistic view, but Solo’s leg strength seems to be leaving her…out of all the goal-kicks she took, only two made it into the center circle. 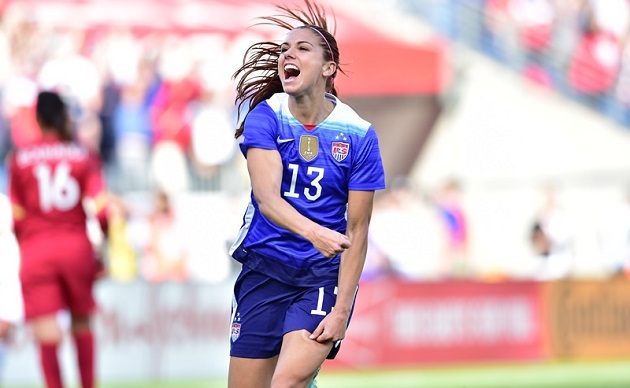 Where will the USWNT turn after Hope? The USWNT should still be the number one team in the world. The USWNT should still be the favorite for any tournament they enter. The USWNT still has some kinks to work out. No matter what the outcome, the SheBelievesCup has been amazing and we hope that it becomes a more common occurrence.